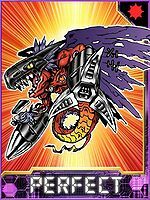 A dark dragon Digimon that is said to boast the strongest, wickedest power among Dragon-type Cyborg Digimon of the Perfect level. As a Digimon that was artificially remodeled by someone, it was programmed to destroy everything. It can definitely be said that its existence is the epitome of a computer virus. It can easily penetrate Computer Networks protected by strong security, and can very easily destroy and then completely reformat the host computer. Its Special Moves are firing countless organic missiles from both of its arms (Genocide Attack), and an attack that is able to cut any material to pieces (Ultimate Slicer). Perfect level, Virus attribute, Darkness type Digimon. Its Special Moves are Ultimate Slicer and Genocide Attack. Genocide Attack  ジェノサイドアタック Jenosaido Atakku Genocide Attack/Darkside Attack/Rocket Attack Shoots a barrage of missiles from its arms. Ultimate Slicer  アルティメットスライサー Arutimetto Suraisā Ultimate Slicer/Parry Force/Ultimate Attack Slashes the enemy with its claws, or uses its arms to send vacuum blades at the enemy. Mega Death Scythe  メガデスサイズ Mega Desu Saisu Big Mega Fire Extends a scythe from one claw and slices enemy with it. Stabs the enemy with its arm. 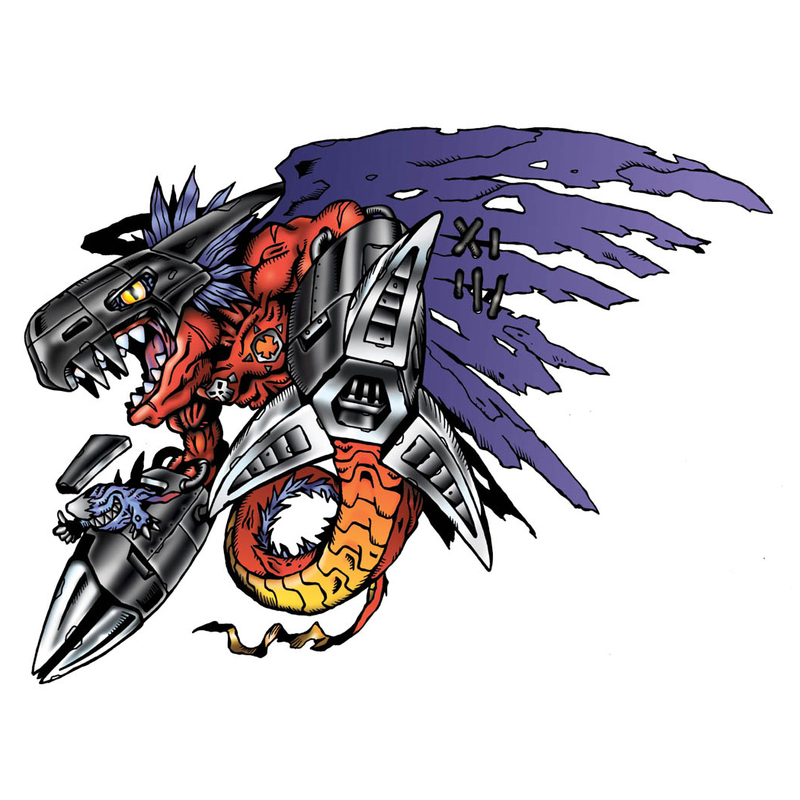 Along with Gigadramon, they served as Mugendramon's air troops. A Megadramon flies wild in the Real World, which Paildramon fights against, causing it to return to the Digital World. A Megadramon was imprisoned in the cloudy mechanical plane of the digital world. However Makino Ruki, Shiota Hirokazu and Kitagawa Kenta accidentally freed him by fixing a jammed clock. He tried to kill Renamon (who evolved to Kyubimon but was overwhelmed) to be able to absorb her data and enter the real world but was defeated by the surprise appearance of Akiyama Ryo and Cyberdramon. Megadramon were part of the Bagra Army in Dragon Land. Megadramon was the Partner Digimon of Himekawa Maki. Saiba Neo owned a Megadramon, which he created by Jogressing a Cockatrimon and a Kuwagamon. It fought Yagami Taichi and Zeromaru, but even though Neo used a technique of infinitely Jogressing and Partitioning to constantly heal it, it couldn't overpower Zeromaru. On the brink of defeat, Neo Jogressed Megadramon with a Jyureimon to create Deathmon. 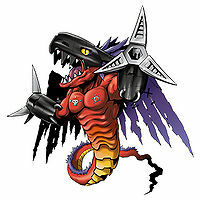 Megadramon appears as an obtainable Perfect-level Virus type Digimon in Digimon World. 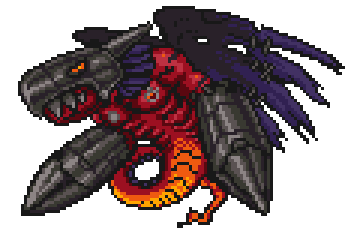 Megadramon serves as the second boss of the Infinity Mountain, in where it'll stay quiet apparently doing nothing, but its blocking the door to the next room, so the Player must speak to it to startle a battle. After its defeated, it'll join the Village of Beginnings, standing outside of Greymon's Battle Arena not doing anything, although recruiting it unlocks it as a possible opponent in the tournaments. Bonus conditions: Battle more than 30 times and have at least 30 different techniques mastered. Megadramon's Digivolution item is the Mega Hand (Japanese: メガハンド) which lets any Adult Digimon evolve into Megadramon. Megadramon is one of the few Perfect Digimon that can evolve, in this case it can evolve into Skull Greymon via Death Evolution, in where it must lose a battle, though this only has a 10% chance of happening so its reccomended to save before trying it. The other Digimon that evolves via this way is Metal Greymon. 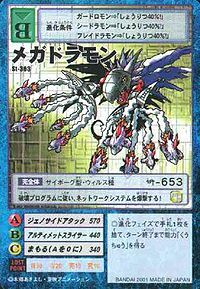 Megadramon is a Perfect level Sky-type Variable Digimon that can be learned by the combination of any Adult Ver. 4 Digimon (Leomon or Cockatrimon). Its signature technique, Genocide Attack deals damage to 1 opponent Digimon. 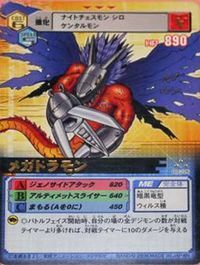 Megadramon is an obtainable Level Perfect Darkness Card with 1810 HP, 920 Circle Attack, 290 Triangle Attack, 300 Cross Attack with First Attack effect. Its Support Effect damages both players' Digimon by halving their HP. Megadramon can be evolved from Birdramon, Centalmon, or Meramon. It can evolve further into Mugendramon. Megadramon can be evolved from Cyclomon with 0+ JP and Deltamon with 0-5 JP. However, Megadramon itself cannot evolve to any Ultimate-Level Digimon. Its Signature Technique is Genocide Attack, which prevents the target Digimon from healing their HP for that turn. Megadramon is an obtainable Digimon that appears during the last stages of Millenniumon. It evolves from Guardromon (with Digimental) as well as Mechanorimon or Cyclomon (without Digimental) and can evolve further into Mugendramon with high Jogress Points or Millenniumon with very high Jogress Points. Its Signature Technique, Genocide Attack, is a Technique that has raises the user's AP gradually when it is attacked. 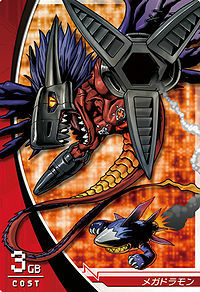 Megadramon is an obtainable Digimon that appears as the mini-boss Digimon in the third room of Gear Field and later used by a Tamer in D1 Tournament Grade 1 (Taichi stage). It evolves from Guardromon (with Digimental) as well as Mechanorimon or Cyclomon (without Digimental) and can evolve further into Mugendramon with high Jogress Points or Millenniumon with very high Jogress Points. Its Signature Technique, Genocide Attack, is a Technique that has raises the user's AP gradually when it is attacked. Megadramon appears as the second last opponent in the Steep Road, replacing Gigadramon as the last opponent only for the first time. 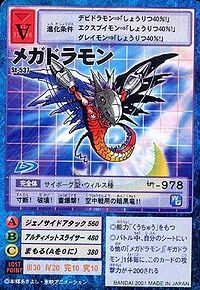 Megadramon is also an obtainable Level Perfect Darkness Card with 1810 HP, 920 Circle Attack, 290 Triangle Attack, 300 Cross Attack with First Attack effect. 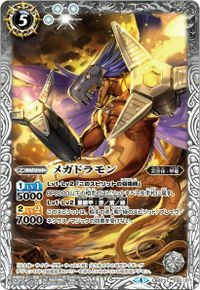 Its Support Effect damages both players' Digimon by halving their HP. 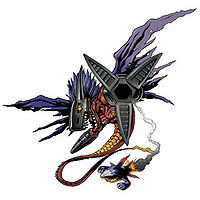 Megadramon is the wild Digimon that can be found in the Dark Takato and Zeed Millenniumon stages. It can converted into a Plug-In Card Genocide Attack, a Technique that has raises the user's AP gradually when it is attacked. Megadramon can be found in Amaterasu's West Sector, in Dum Dum Factory. In the Europe and Japanese version, Megadramon can also be found in Amaterasu's Circuit Board underground, after finishing the main storyline by defeating Ragnamon. 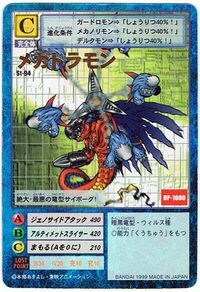 Megadramon is an obtainable Digimon card that belongs to Green card with 2 S-Energy cost and has 26 AP / 20 HP. Megadramon can be evolved from Stingmon if above level 33 and Machine EXP above 3000, or can be found at Junk Factory. It can evolve into Mugendramon if above level 43. Megadramon can be evolved from Airdramon if above level 34 and Machine EXP 3600. 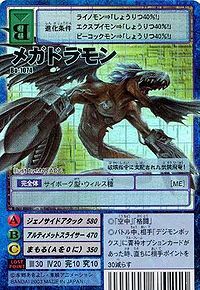 It can evolve into Darkdramon if above level 52, Darkness EXP 12000, and Machine EXP 9000. Megadramon is an obtainable Digimon that can be evolved from Growmon, Seadramon, Dark Tyranomon, or Devidramon if you win 10 battles. It can evolve further into Dukemon. Megadramon is an obtainable Digimon which is evolved from Airdramon, Birdramon, Greymon, or Seadramon, and can evolve to Darkdramon. It can also be obtained as a collectible card. 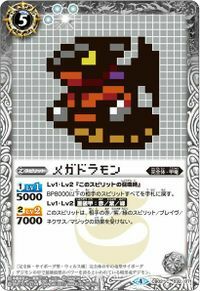 Its card is part of the Crack Team (クラックチーム Kurakku Chīmu) set and the Mega Digimons (メガデジモンズ Mega Dejimonzu) set. Megadramon can be evolved from Monochromon, Leomon, or Coelamon. Megadramon is the boss Digimon of Area 06. Megadramon can be evolved from Guardromon or Mechanorimon if 1 or less calls, Win Ratio 40% or higher, Training 40+ times, Battle 30 times. Megadramon can be Jogress with a compatible Digimon to get Mugendramon. Megadramon can be evolved from Guardromon or Mechanorimon if 1 or less calls, Win Ratio 40% or higher, Training 40+ times, Battle 30 times. 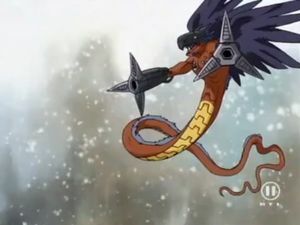 Megadramon can be Jogress with a compatible Digimon to get Venom Vamdemon. Megadramon is an enemy Digimon in Secret S.
Megadramon is an obtainable Digimon by Jogressing XV-mon with Tyranomon (Pendulum Progress 1.0), Angemon (2.0) or Dobermon (3.0) or by Jogress via Tyranomon with Airdramon (D-Scanner 1.0). Megadramon can evolve further into Chaosdramon, Dukemon, Megidramon, Ulforce V-dramon, or War Greymon. Megadramon is an enemy Digimon. 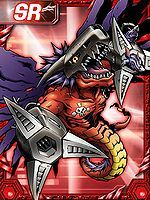 The most evil dragon cyborg! Following its destruction program, it attacks the network system! Tear! Destroy! Bombard! This dark dragon was made for aerial combat!! 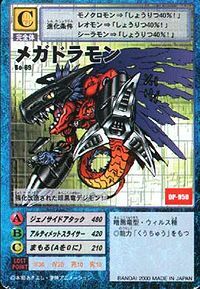 A Dark Dragon Digimon that has been modified and strengthened! This armed flying dragon is ruled by its orders for destruction! A Virus Dark Dragon who was modified by an unknown entity to be able to destroy a network even when working alone. It invades computer networks and destroys their host computers, inserting its own modifications all while barely expending any effort. ↑ 17.0 17.1 Digimon Adventure V-Tamer 01: "Battle on the Tree"